These clamps were designed for the transfer of steel beams and attachment of tackle eyes. They come in a wide variety of capacities with jaw openings from 3" - 40" and Working Load Limits from 2T - 25T. They have a welded alloy steel body for strength and a compact frame size. Forged alloy components are used where needed to ensure strength. 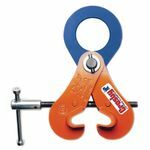 Each clamp is individually proof-tested at 2 times the Working Load Limit with certification, and a serial number and test date is stamped into the body. RFID equipped. Replacement parts available.